Be sure to not leave this page before following the link to the best part: my Trajan's Column Plaster Casts page. Trajan's Column is a 98-foot-tall marble column which commemorates Emperor Trajan's victories in the two Dacian (Romanian) wars, from 101 to 102 AD, and 105 to 106 AD. A 625-foot-long frieze winds around the column 23 times, depicting the wars (closeup in 2nd photo below). The victories in those wars expanded the Roman Empire to the largest extent it would ever have. Of the 155 total scenes on this frieze, Trajan appears 59 times, but, interestingly enough, never in actual battle. Trajan's image instead functions to show his control and determination to defeat the Dacians and his presence as a leader to the troops. The column is made from a series of 20 Carrara marble drums, each weighing about 32 tons. A spiral staircase of 184 steps carved inside the shaft leads to a viewing platform at the top, but this staircase is now closed. A statue of emperor Trajan once stood at the top, but it was lost during the Middle Ages. Pope Sixtus V had a bronze statue of St. Peter put at the top in 1587, and it is still there today. Trajan's ashes, and those of his wife Plotina, were buried in the Column's base after his death in 117 AD, but the ashes no longer lie there. See all Trajan's Column photos. 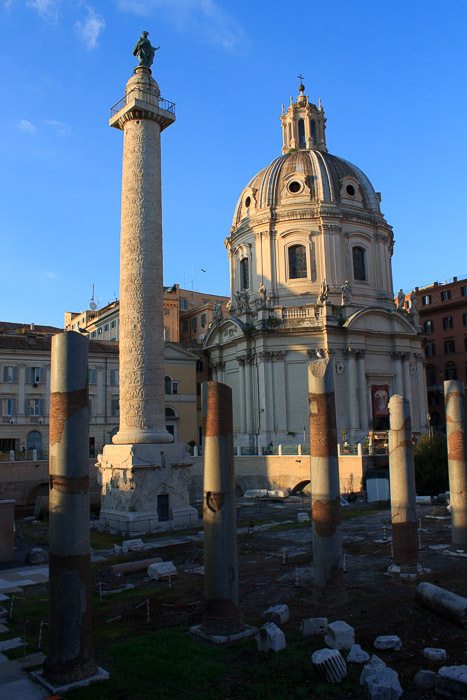 The column is located near Trajan's Forum, next to the Basilica Ulpia. 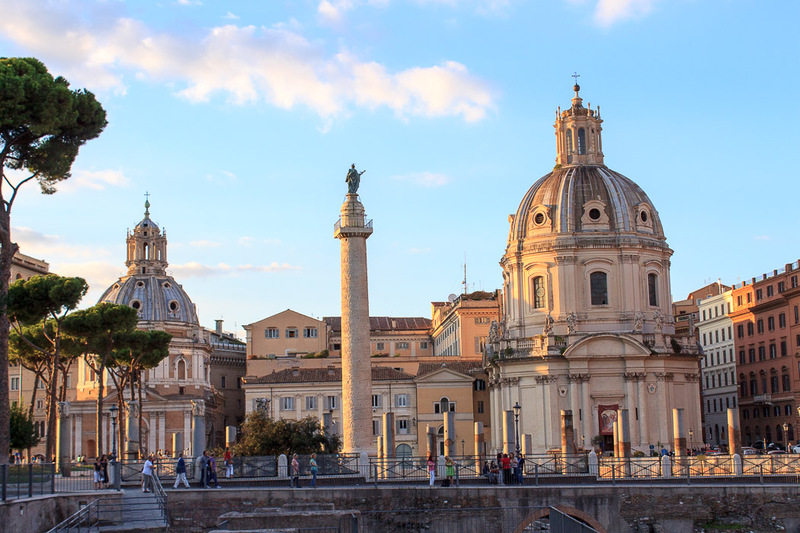 There is speculation that there once existed a Temple of Divine Trajan on the other side of the column from the Basilica Ulpia, but nothing remains standing of that temple today. On the other two sides of the column, northeast and southwest, stood two libraries: one with Greek literature, the other with Latin literature. Combined, they housed 22,000 scrolls. The entire complex, including Trajan's Market, required that the edge of the Quirinal Hill be excavated, and the arch-shape of Trajan's Market was designed as a retaining wall to support the hillside. The overall 125-foot-height of the column and its base were chosen to place the top of the column at the same height as the part of the hill that was excavated. Today the column stands in front of two churches (photo below): Santa Maria di Loreto (on the left) and Santissimo Nome di Maria al Foro Traiano (on the right). Three plaster casts of the relief were made during 1861-2, and they are now preserved better than the original since the original has deteriorated due to weather and pollution since the casts were made. One of those was given to the Lateran Museum, where it remained until 1953 when it was donated to the Museum of Roman Civilization by Pope Pius XII. The others are at St. Germain in Paris, and in the Victoria and Albert Museum in London. 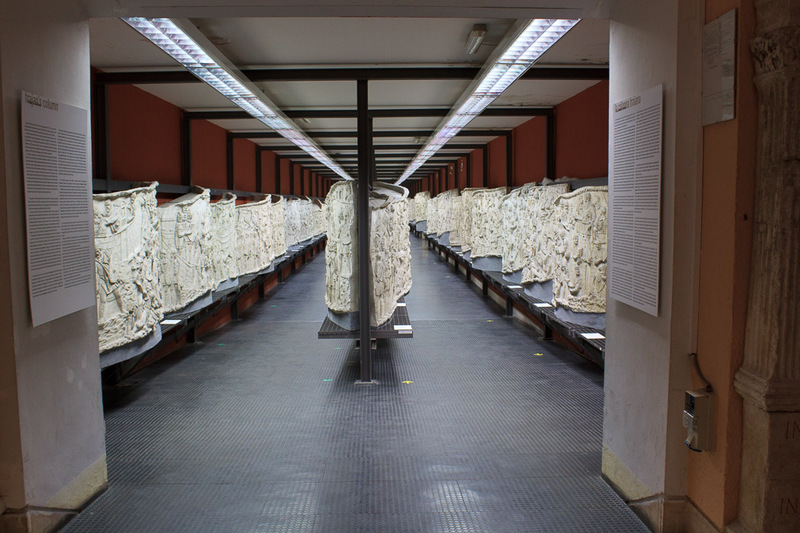 The copy at the Museum of Roman Civilization is well-displayed at eye level, along with brief descriptions of each section. Since the real column can only be viewed from ground level, and from some distance (perhaps 20 feet), examination of this copy is the easiest way to see the details in the frieze. They can be viewed on my Trajan's Column Plaster Casts page. 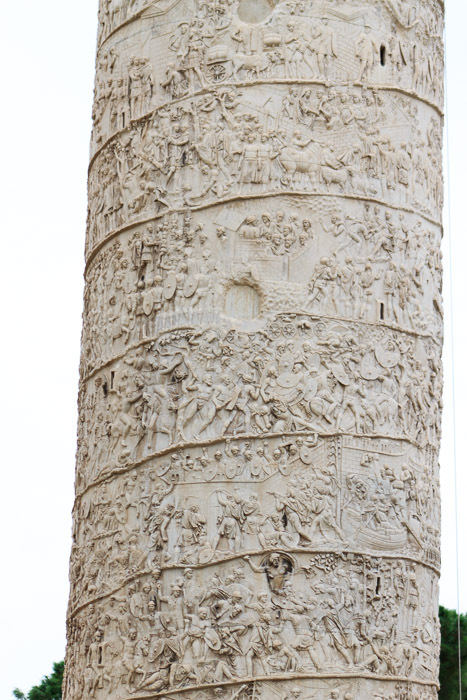 See all Photos of the Plaster Cast of Trajan's Column.